This shows a parabolic dish of radius $R$ and depth $D$ pointed at normals to a wind with velocity $v$. Herein lies the problem. The analytical solution to this parameter relies on the unknown quantity that we’re trying to calculate. Not only that, but the quantity is a function of many other parameters. These include flow speed of the liquid, flow direction, size and even viscosity. Some of these can be parametrised and neglected, however it’s still a very complex problem that is only really solvable with either numerical computer simulations or experimentation. 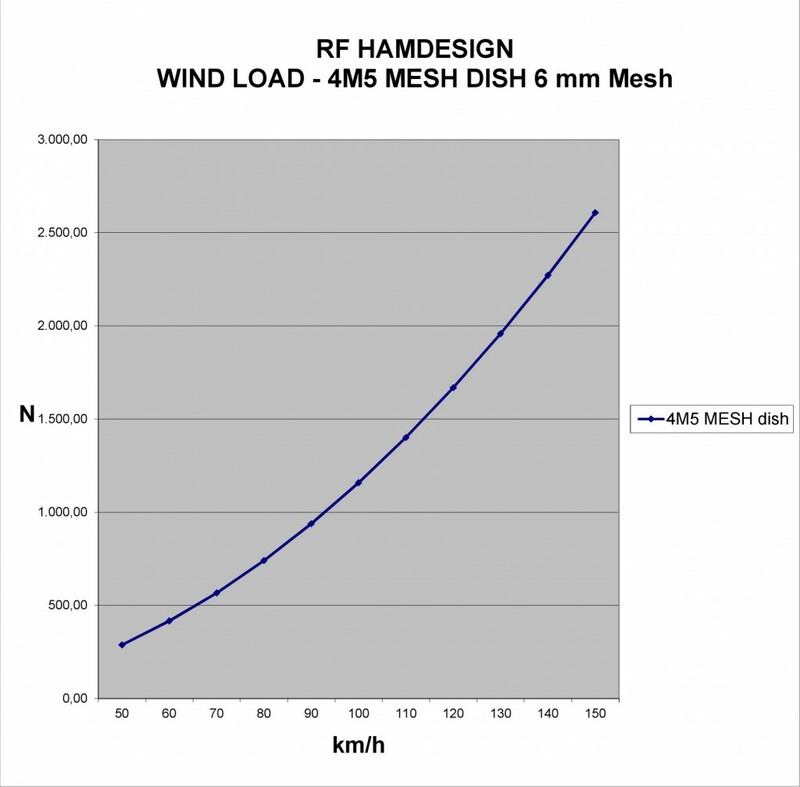 Fortunately, the supplier of the dish, RF Hamdesign in the Netherlands, has already performed these experiments for us under precisely controlled conditions, giving a proper wind loading calculation as a function of wind speed. Wind loading on the dish as a function of wind speed. © 2012 RF Hamdesign. If you could ascertain the drag coefficient $C_d$, then you would be able to substitute in and calculate this value for yourself, however we chose to simply side with the data from the professionals. In this post, I’ve given you a bit of a look at one of the things it’s very important to consider when planning and constructing your own radio telescope, or for that many nearly any long-term engineering project. I hope I’ve been able to give you a taste of the calculations involved and how they can be solved, for the most part, using readily available data. In the following posts we shall be continuing our coverage of construction of the motor electronics.